Current global nitrogen fertilizer use is of the order of 100 million tonnes per annum, a proportion of which is transported by sea. Because plants require nutrients other than nitrogen, however, a range of compound or complex fertilizer formulations have been developed which contain more than one of the three main plant nutrients: these are nitrogen (N), phosphate (P), and potash (K)*. *[“K” is the chemical symbol for potassium]. Fertilizer compositions containing all three nutrients are generally referred to as NPK fertilizers; this designation is usually followed by a three numbers, such as 15-15-15 or 16-6-9, to indicate the percentages of the respective nutrients present in the formulation. The formulations are generally ammonium nitrate-based, usually produced in prill or granular form, and are often shipped in bulk as non-hazardous cargoes. Ammonium nitrate based NPK fertilizers are thermally stable and are not prone to self-heat dangerously under normal conditions of storage and transport. They are not combustible but when heated sufficiently they will decompose. The decomposition process is exothermic (heat is released) and is accompanied by the production of copious quantities of fumes containing water vapour and numerous toxic gases such as oxides of nitrogen, hydrogen chloride, ammonia and chlorine. The exact composition of the fumes produced will depend on the temperature and the precise composition of the formulation: apart from the principal constituents, frequently other additives are present to accommodate specific agronomic requirements or quality parameters (e.g. caking tendencies and thermal stability). In some cases the decomposition, initiated by an external heat source, will stop when the heat source is removed. With some fertilizers, however, the decomposition will continue and will spread deep into the bulk of the material even when the heat source is removed. This process is referred to as self-sustaining decomposition and progresses relatively slowly. Relatively minor heat sources, such as buried lighting or self-heating resulting from contamination, can be sufficient to initiate decomposition in some instances. In addition to the above, ammonium nitrate-based fertilizer cargoes are hygroscopic. 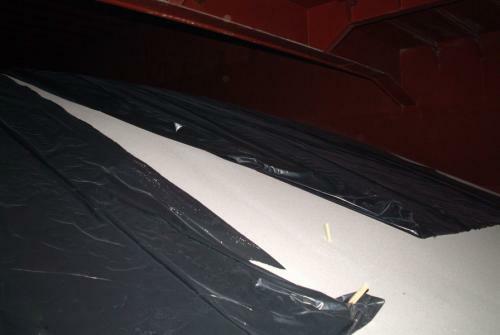 In order to prevent caking or moisture pickup, therefore, the cargo surface may be protected against humidity by plastic sheeting. Ammonium Nitrate Based Fertilizer UN No. 2071 This includes compound or complex fertilizers (NPK/NP/NK), which are capable of undergoing self-sustaining decomposition: they are designated as IMDG Class 9. These were formerly referred to as Type B.
Suitability for transportation is determined using the UN “Trough test”. Under the conditions of the Test the self-sustaining decomposition rate of the cargo, which is measured in metres of propagation per hour (m/hr), must be less than 0.25m/hr. 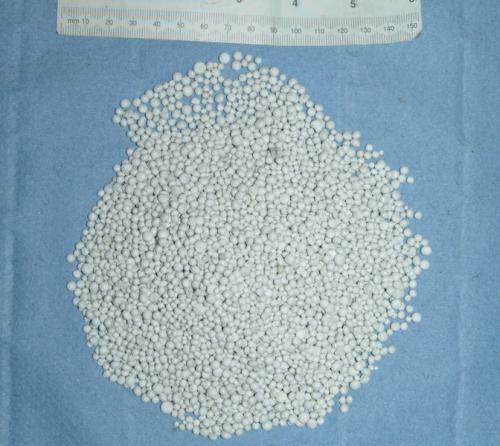 Ammonium Nitrate Based Fertilizer (non-hazardous). These were formerly referred to as Type C. Fertilizers conforming to the UN 2071 composition, but which do not exhibit the property of self-sustaining decomposition, as determined using the UN Trough test, will fall into this category. 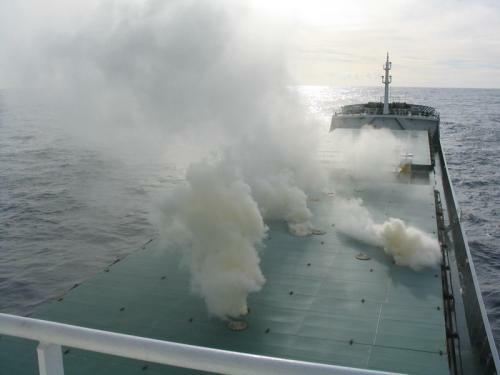 As will be apparent from the above the principal means of classifying an NPK cargo as “non-hazardous” is on the basis of its performance in the Trough test. Our experience, however, is that the Trough test does not adequately reflect the potentially hazardous behaviour in bulk of material that under the conditions of the test can be designated “non-hazardous”. Prior to loading the Master should obtain a Material Safety Data Sheet (MSDS) for the cargo to be loaded and should familiarise himself, and comply fully, with the provisions of the Bulk Code: this should also include familiarization with the Emergency Procedures. All lights and other heat sources in cargo holds should be switched off prior to loading and should remain off throughout the voyage so long as the fertilizer is on board. Electrical circuits within cargo holds should be properly isolated while the cargo is on board. Welding or any other form of hot work that could affect the cargo should not be permitted while the fertilizer is on board. Contamination of the cargo with oils and fuels, e.g. from loading equipment in the holds, should be avoided: in the event that contamination does occur all contaminated cargo should be removed. As mentioned above, the rate of decomposition with this type of cargo is relatively slow although it will be accompanied by considerable quantities of gaseous by-products. Decomposition is indicated by the release of brownish/white fumes. These will need to be ventilated although, because of the toxic nature of the fumes, the ship should be orientated to minimize the risk of gases reaching the accommodation. If the ship is in port it may prove necessary to move it away from an inhabited area. Self contained breathing apparatus and suitable protective clothing should be worn in the vicinity of the fumes. It should be emphasized that the reaction producing the gas involves chemical decomposition rather than combustion, and is, therefore, not dependant on the presence of oxygen to sustain the process. The use of CO2 or other forms of inerting or smothering agent are, consequently, useless. The only effective way of terminating the reaction, therefore, is to remove the heat from the reacting zone. Prompt action is required to prevent the decomposition from escalating. If detected very early and the initiating external source of heat can be identified, this should be turned off or removed, if this can be achieved safely. This in itself may result in the process terminating. In the more likely event that this action proves unsuccessful, the most effective means of removing heat from the system will involve the use of copious quantities of water directed into the reacting zone. This has been achieved effectively using water lances pushed in to the cargo in the relevant area although this is unlikely to be a practicable solution unless suitable water lances are readily available. If large quantities of water are necessary to quell the reaction, in the absence of a more focussed approach, consideration will have to be given to flooding the affected hold. In such circumstances due regard must be given to the stress and stability implications this will have for the vessel. As the reaction zone is localised, an IR thermometer is an effective way to locate the hotspot. 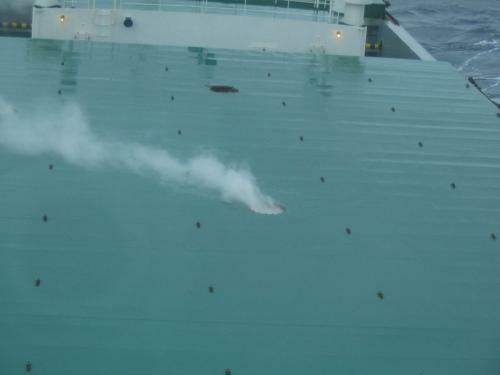 It should be noted that wetted fertilizer can set like concrete in time and every effort should be made to discharge water damaged cargo at the earliest possible opportunity. The products of the decomposition are also highly corrosive to the ship’s structure. 1. Full details of the requirements for stowage and transportation are to be found in the current (2009) edition of the IMSBC Code. Further more comprehensive information on this subject can be provided on request.